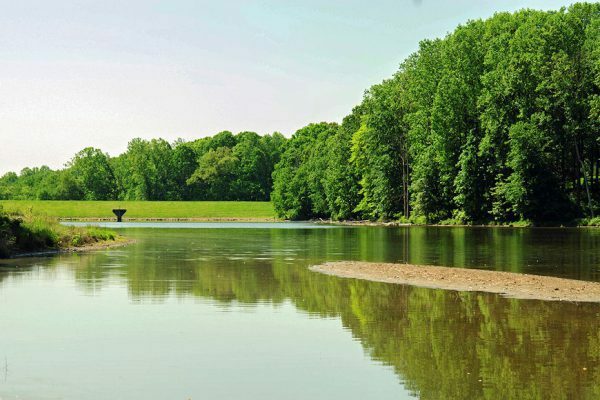 Woodglen Lake Park is a 50-acre park in the Braddock District, between Sideburn Road and Ox Road in Fairfax. There are trails, though there’s no loop trail all the way around the lake, and the shoreline can be hard to reach in places because of flora. 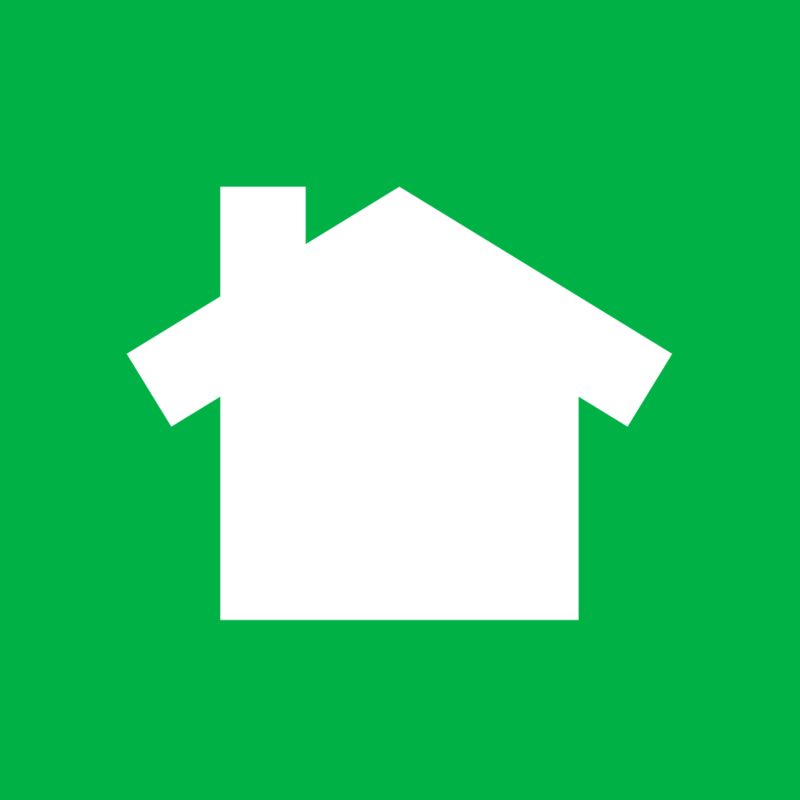 Private housing backs up close to the lake in some places, so be sure to stay on the public land near the water. Boating is limited to carry-in craft, and motors are banned. The lake was dredged in 2015, and a forebay was created to make the lake more efficient at trapping sediment. Woodglen drains an area of about 1.16 square miles and has a surface area of about 12.5 acres at normal pool. Public parking for access to the lake is at the end of Fireside Court near the dam. There’s space for only a handful of cars. There’s a paved trail running from there for about two-tenths of a mile across the top of the dam and out of the park at on the other side of the dam. There is no public parking at the Zion Drive trail entrance on the upper end of the lake. There are no facilities at the lake. The following list of historic Middleridge street names was compiled by Kay and John Gilbert with supplements from additional Middleridge residents. In the 1850’s many new churches were built in Fairfax County, including a Methodist on, Andrew Chapel, in Vienna. After the war the Government paid a claim to repair the damage to the chapel by Union soldiers. It is located on Route 7 at Trap Road. Ann Peake married Frances Adams in 1777. He was a trustee of the town of Centreville, when it was formed in 1792. They owned a lovely home, Mt. Gilead, which was uses as a general’s residence during the war and is a private residence today. Captain Charles Broadwater came to Virginia in 1715 and acquired 1701 acres of Northern Neck grants. He was one of the first five Vestrymen elected to Truro Parish and served until his death in 1733. His son and heir, Charles, was a Vestryman from 1744 to 1765 and served as a Justice of the Peace Fairfax County beginning in 1749. (The following information provided by Jim Tully) Charles Broadwater also served as the County Sheriff is 1751 and 1755. R. F. Broadwater served as the County Sheriff is 1874. Clara Barton tended to the wounded of the Second Battle of Manassas, August 29-30, 1862, at St. Mary’s Church and Fairfax Station railroad depot. The wounded were brought there from the battlefield for transport by train to hospitals. Clara Barton later founded the American Red Cross. This segment of street in Middleridge is a continuation from Country Club View, and has no known historic significance to the community. George Deneale erected a home called Innisvail in Fairfax Station about 1770. He was the first Fairfax County clerk, after the new court house was built in Providence in 1800. Providence was the name of the town before it became Fairfax. William Deneale served as sheriff of Fairfax County in 1799. The Earp family came from Maryland and opened a tavern before 1742, known as Earp’s Ordinary. It became so popular that the area around it was known as Earp’s Corner. Tolls for the Little River Turnpike were collected there. George Washington was a guest on one of his surveying trips for Lord Fairfax. It is still standing, the pink house at 237 Main Street, just east of University Drive. Thomazen Ellzey was a planter-lawyer, who owned a large tract of land in this area, including what is now Brecon Ridge. He gave the land, including the “middle ridge”, where Payne built his church. Lewis Elzey was sheriff of Fairfax County in 1742 and 1749. Francy Adams was one of the first Justices of the Peace (Gentleman Justices) in the new Court House of Fairfax in April 1800. Governor Yeardley was one of Virginia’s first colonial governors. In 1619 he organized and presided at the first representative assembly in an English colony. History not known as it relates to Middleridge but Hill Cumorah has importance to Mormons. James Halley was born in 1707 and received a 690 acre grant of land on the North side of South Run Pohick in 1742. He voted in Fairfax County 1744-68, and his will was probated in 1792. He was one of the men ordered by the Court in 1752 to mark the way for clearing a road west from Alexandria to Rocky Run, which became Braddock Road. John Ayres drew the plans for and estimated the cost of building Paynes Church. He served as a Colonel in the Revolutionary War. John Turley was given a land grant of 453 acres in 1727 on Sandy Run. He was a Vestryman of Truro Parish 1749 until his death in 1756. Joshua Davis was an attorney who served as a Justice in the Court of Richmond County. There are records of his name in 1676, 1692 and as Justice in 1704-05. The Kipp’s sold some of their land to Foster Brothers for construction of Section 12 of Middleridge. “Landmarks of Old Prince William” written by Fairfax Harrison in 1924 is a well used history of the area, basic to any historical research. “Middlegate Farm” was the 20th century name given to the farm know as Walney that existed in Centreville from the 1770’s. In 1935, David and Ellanor C. Lawrence bought the 678 acre estate, and proceeded to turn it into a lovely home, preserving the natural beauty of the land. Upon their deaths, it was donated to Fairfax County and is known as the Eleanor C. Lawrence Park. Mt. Vineyard was the name of the Ratcliff home. Ratcliff was a large landowner, on whose land most of the town of Fairfax was built. He sold the 4 acres for the Court House for the sum of $1. The original home burned, but the family graveyard is still on Moore Street. The County of Fairfax was formed in 1742, separating it from Prince William county. The Court House was to be built in Springfield, between Ox and New Church Roads in the area of what is now Tyson’s Corner. There was a beautiful oak park at the Ravensworth mansion, built by William Fitzhugh in 1800. 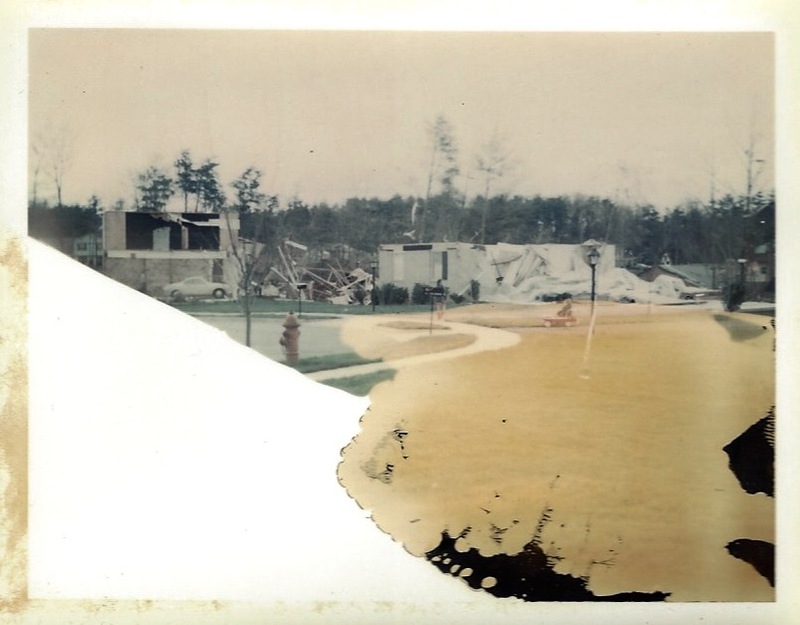 The mansion was destroyed by fire in 1924 and all traces of it and the park disappeared with the 1960’s housing developments. Captain Quincy Marr, from Warrenton, was a representative in Richmond in 1861. He returned home to organize “Warrenton’s Rifles’, a company of infantry to uphold secession. He was the first Confederate officer to be killed, in a battle at Fairfax Courthouse on June 1, 1861. A monument was erected to him in 1904 on the Court House grounds. Richard Blackburn came from Rippon, England and built Rippon Lodge in 1725, north of Neabsco creek and south of Occoquan, with a commanding view of the Potomac. Blackburn planned his house and Mount Vernon. ‘Mt. Vineyard’ later became know as the Rumsey Place. The Rumsey’s were a prominent family in the mid-1800’s. Shuter’s Hill was the beautiful family home and cemetery of Ludwell and Flora Lee, who often entertained General and Mrs. Washington. It was located on the site of George Washington National Masonic Memorial in Alexandria. Federal troops built a Civil War fortification on the site and destroyed the remains of the home. Fairfax Harrison in his “Landmarks” spells it Shooters Hill. There was a Jeremiah Spurlock, aged 86, listed in the 1790 Census. The Census listed his address as Fairfax, Virginia. William Spurlock was born in Montgomery County Virginia approx 1687. He married Anna Toney. William Spurlock was given the land grant to what is current day Henrico County Virginia by the British Monarch, and was an early settler of the Commonwealth. The family still exists today, and was influential in the settlement of Kentucky. His grandson (also William) settled Harlan County, KY and most of the family is still there. Check Spurlock Family for more details. William Stanhope was one of the first Justices of the Peace (Gentlemen Justices) in the new Court House after 1800. (The following information provided by Jim Tully) In 1800, William Stanhope served as Sheriff of Fairfax County. This cul-de-sac is located on a crest overlooking the “new” Woodglen Lake. This was a well know tavern built by Captain Willcoxon, who came from Maryland. It was located on the corner across from the Court House, where the National Bank of Fairfax is now located. These photos are Polaroids taken by Middleridge resident, Mr. 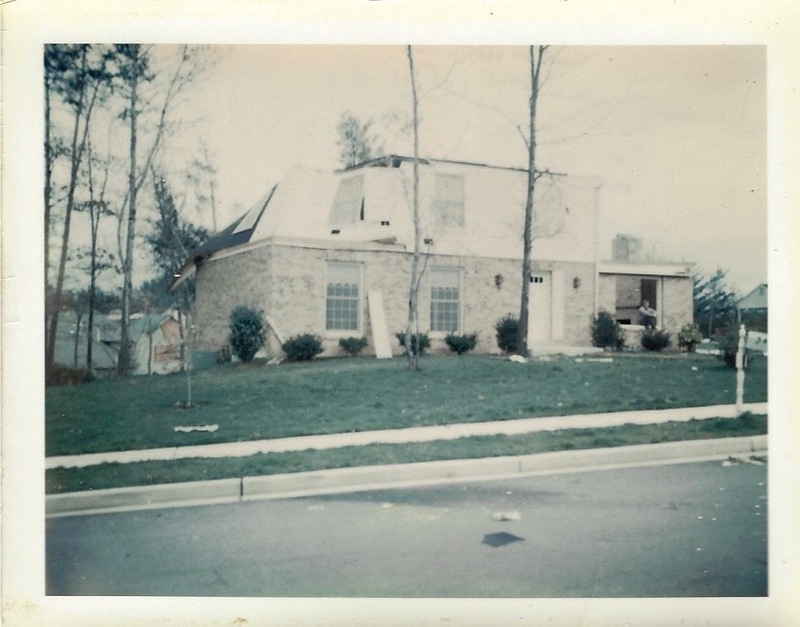 Von Egger, a day or two after the April 1, 1973 tornado ripped through Middleridge, Fairfax and Falls Church. You can see, if you look carefully, some houses down along Paynes Church Drive that already have had some temporary cover put up. However, nothing except personal salvage has been done to the two destroyed houses. All these pictures are taken from Rumsey Place, mostly from Mr. Von Egger’s yard or from the top of the cul-de-sac. “A thunderstorm moving northeast near Manassas, Virginia spawned a tornado in Prince William County during the mid-afternoon of April 1. The twister skipped over a twenty-mile path to just north of Falls Church, Virginia. The first serious damage was noted south of Braddock Road at the Middle Ridge development, where a dozen homes were seriously damaged. The tornado then bounced back aloft before slamming into homes about a mile to the north, near the intersection of Braddock and Ox Roads. At least one house was lifted off its foundation and blown across Braddock Road. The twister then hopped aloft again, next coming down about two miles to the northeast, near Little River Turnpike, where it did serious damage to the Pickett Shopping Center and Woodson High School. The tornado then made a final hop of three miles to the northeast before coming down in the Merrifield section at Lee Highway, near the Beltway. At that time, it sliced through the Pine Springs garden apartment complex and several other residences and businesses. 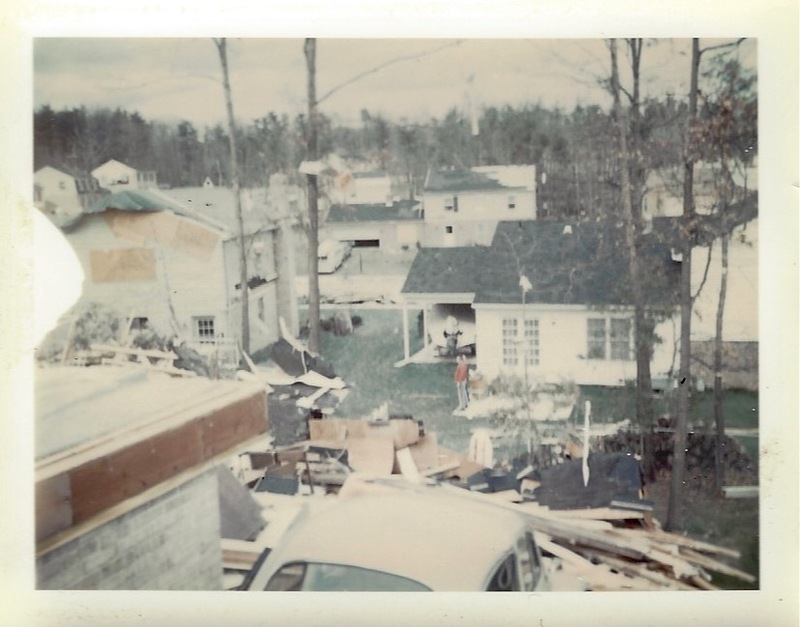 In all, 226 homes were damaged, 53 homes were declared uninhabitable, and 13 homes were totally destroyed. Also, 94 garden apartment units were damaged and 50 businesses sustained losses. Two elementary schools, Mantua and Oakview, were damaged. Woodson High School had its roof ripped off and several walls blown down. It was closed for the rest of the school year. Dozens of kids were in the Woodson gym playing basketball when the roof blew off. Luckily, there were no serious injuries. This was a two-story colonial with a carport on the right end. The original owners, Ray and Ellie Chapman, were saved by going to lunch after church that day. So, they missed the storm, but came home to this. Much of the 2nd floor was dumped into the back yard. The carport is gone. They rebuilt and years later retired to Arizona. A close-up of the debris behind the Chapman’s house. The side of the house in the center of the picture (on Payne’s Church Dr), was torn off leaving the room inside exposed. Standing in what was the Howe’s carport looking north down to Payne’s Church Drive. Their VW Beetle was pushed off the carport into the backyard at the bottom of the picture. 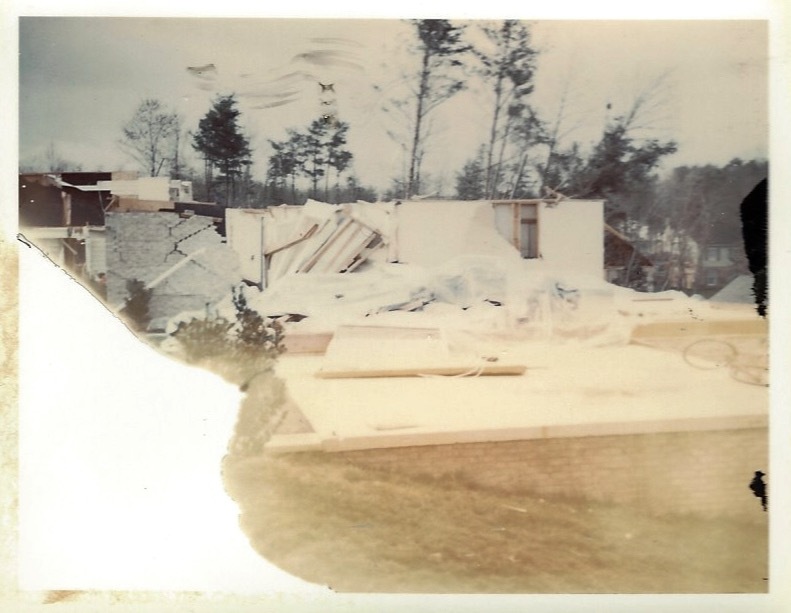 The debris in the foreground is mostly the Howe’s house in their backyard. 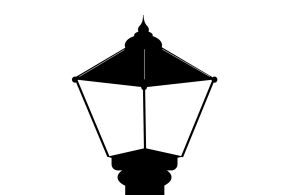 The house facing at the top center is on the corner of Payne’s Church and Quincy Marr Dr. 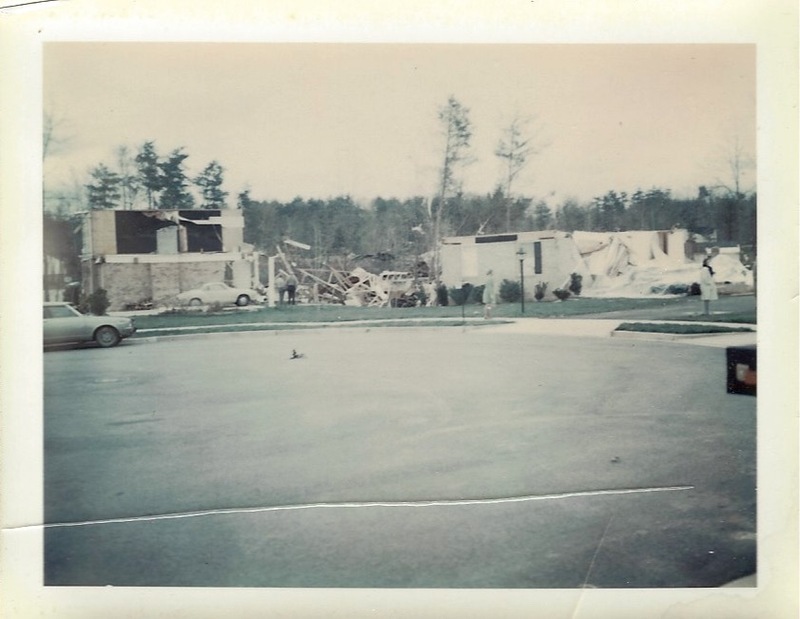 Looking across the circle at the two destroyed homes. The Chapman’s home is to the left and the rambler, which belonged at the time to the Howes is to the right. The area on the right of that house was a dinette/kitchen that collapsed on Mr. Howe. The stairs to the basement are in the middle of the house. The carport is completely gone. This is a good view of the debris behind the Chapman’s house that was their 2nd floor and roof. Another view, slightly panned to the right. 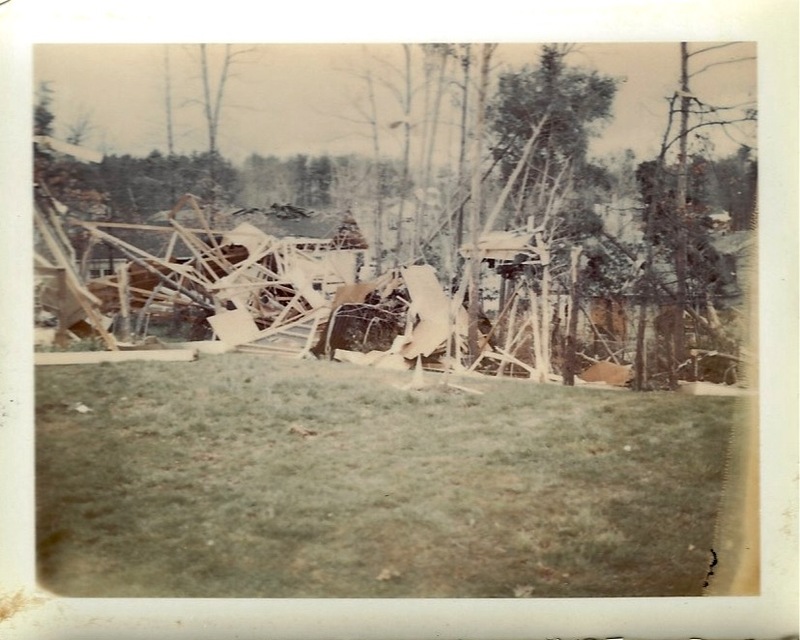 A badly damaged photo showing the Howe’s house remains. The carport slab is in the foreground, next to the flattened kitchen. The broken brick façade and stripped other rooms are partially standing.